To celebrate the imminent release of EP 5-6-7-8-9 The Aints! will hit the road for shows both city and regional; select shows featuring two sets from The Aints! while others will feature Kuepper and The Aints! brass arranger Eamon Dilworth appearing in duo mode as Colonel Kramer with Eamon Dilworth One Man Brass Ensemble. Formed in 2017 The Aints! 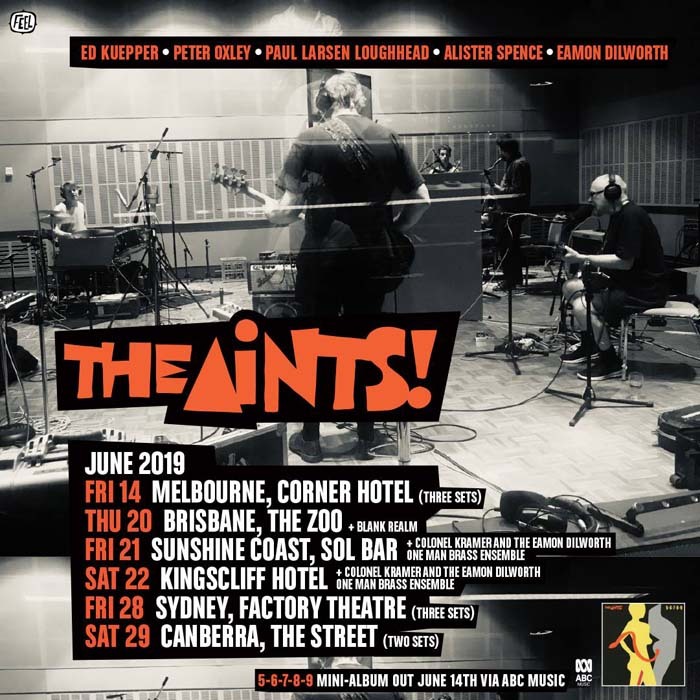 original brief was to recreate the sound and energy of The Saints, the band co-founded by Kuepper in 1973, as they celebrated 40 years since the release of that band's groundbreaking debut (I’m) Stranded in 1977. With such talent at play though, it wasn’t long before this inspired five piece created material of their own. An album The Church of Simultaneous Existence, comprised entirely of Kuepper originals written in the period 1969-1978, was released internationally to much fanfare and was a hit with fans and critics alike. 5-6-7-8-9 (the name taking it’s cue from The Saints’ 1977 4-track EP release 1-2-3-4) is the next release from The Aints! A five-track EP comprising alternate versions of album tracks Goodnight Ladies (single edit) and Country Song in G (acoustic) plus reworked versions of tracks from Kuepper’s 50 albums strong catalogue including Memories Are Made Of This (The Saints, 1978) Laughing Clowns (Laughing Clowns, 1980) and Hang Jean Lee (Ed Kuepper & The Kowalski Collective, 2007). Lead track Goodnight Ladies, with its glam-stomp and bubblegum-brass, is the oldest track Ed Kuepper has ever committed to disc with its origins acting back to 1969 when Ed was still a schoolboy, continuing its development up to 1973 and finally reaching completion in 2017. Laughing Clowns meanwhile, was the final song Kuepper ever wrote for the original Saints; presented to singer Chris Bailey back in 1978 but passed over leading to the band calling it quits that year. Kuepper would then appropriate 'Laughing Clowns’ as a band name and a new sound for his immediate post-Saints outfit, but it is presented here closer to its original form. 5-6-7-8-9 will be released Friday June 14th on CD, digital and vinyl here. Tickets on sale Wednesday 10th April from Feel Presents.